The mobile market waits for no one as smartphone technology is improving all the time, and for many of us that are old enough will remember the bricks that we used to have to carry around with us. 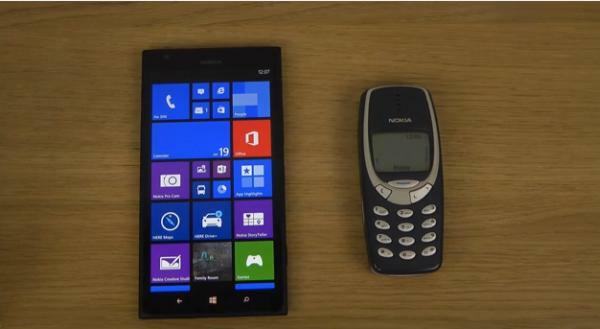 Today we have a video that is looking at the Nokia Lumia 1520 vs. Nokia 3310 in an evolving speed test. The Nokia 3310 was a hugely popular handset in its time and we still have one that works stuck in a drawer in the office, but the mobile world has moved on considerably since then. Today the handset is tested against the modern Nokia flagship handset in the form of the Lumia 1520. It begins by showing us that the older handset has a ringtone that is still found on Nokia devices now, but the person in the video doesn’t seem sure how to use the Nokia 3310 correctly as he didn’t know how to adjust the ringer volume. We then get to see how quick each of the handsets boots back up again after being powered down, but we won’t spoil the outcome for you, and you may want to watch a previous video that we had that compared the Nokia 3310 with the iPhone 5S. Did you once own the Nokia 3310?